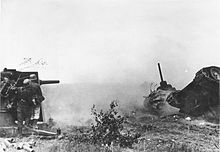 In June of 1939 Italy had credits of about 300 million Italilan lire with Germany for the sale of processed materials, therefore the Ministro della Guerra (Ministry of War) proposed that these credits be paid with the sale of 50 batteries 8.8 Flak (88/55 in the Italian denomination), equal to 300 guns with relative ammunition. 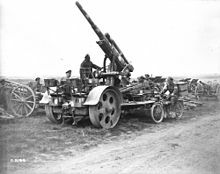 While the proposal was accepted in principle, the German authorities stated that they did not have that quantity of pieces available, so they paid off the debt in part with 8.8 cm Flak and partly with the 7.5 cm kanon (75/50 in the Italian name). 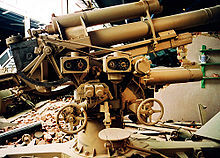 In the proposal presented by the German authorities, the Italian supply of mechanical parts for anti-aircraft guns and Anti-tank guns was also envisaged, so the production of components for artillery was started in the workshops Ansaldo in (Genoa and Pozzuoli) and OTO. The batteries were supplied complete with a Zeiss firing station Mod. 36 and related auxiliary equipment. 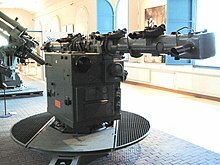 The batteries began arriving in Italy a few days after Italy entered the war, and were initially assigned in part to the Milizia Volontaria per la Sicurezza Nazionale (Voluntary Militia for National Security, MACA), for the protection of theItalian main cities and partly sent in Libya, for the protection of ports. Some groups were subsequently assigned to mobile motorcycle sections. However it was immediately evident that the Regio Esercito (Italian Royal Army) did not have at its disposal a tractor with characteristics suitable for towing this piece, given that the task was entrusted to Lancia 3Ro, without all-wheel drive. 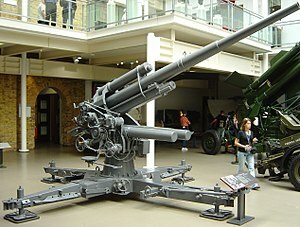 At the end of 1940, 44 pieces and relative firing stations were available. Starting from October 1942, several batteries, while remaining in German possession, were used by Italian personnel (officers and troops) for the protection of military infrastructures and cities, this practice was further intensified in 1943, reaching more than 100 batteries. 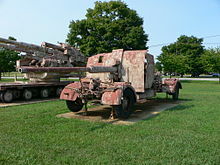 In addition to the cannons that arrived for the canals established in 1940, in 1943, 24 pieces and their tractors were transferred to Italy intended for equipping the 1ª Divisione corazzata "M" (1st Armored Division "M"). 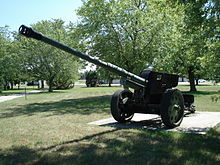 The 88/55 in the Regio Esercito was used in its natural role, that is, as an anti-aircraft weapon, its use as an anti-tank cannon was limited to the theaters of Northern Africa (Libya and Tunisia) and only for a few gruppi autocampali (self-transported field artillery groups). ^ Cappellano 1998, p. 211. ^ Cappellano 1998, p. 216. ^ Cappellano 1998, p. 217.